The Crypt Church in the Basilica of the National Shrine of the Immaculate Conception in DC is a space that speaks deeply to me, that pulls me in and makes my heart vibrate. A deeper part of my soul resonates at the same pitch as the walls, and the whole place hums. It is a womb-like space, under the main nave, with curved tile ceilings and glints of copper and gold tile. When you sit there, you can hear the gentle trickle of water in a baptismal pool to your left. It is mostly underground, with flickering candles reflecting off the mosaics, and the entire space is suffused with incense. It is sweet and warm and powerful. The walls have soaked up the prayers of countless pilgrims who have traveled there with yearning hearts. As I sat there with my prayer blanket, person after person came in to kneel in prayer and devotion. It is a living space, a breathing space. It makes me wonder, with our hope to renovate parts of this nave, how this space could be that for this community. Can people be drawn here to pray? The lights in the chapel are dim. Your eyes are invited to linger, to rest a bit longer on this candle or that mosaic or that play of light off the copper tile-work. It takes time to see what there is to see. 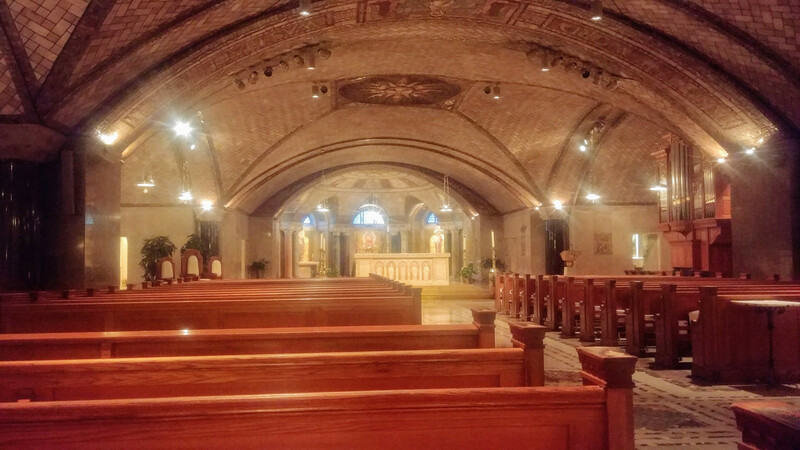 The arched ceilings hold you safely while you are challenged to share with the Blessed Mother—who very much is the heart of the space—in pondering all these things in your heart. You are changed by what you encounter there. I know I have been. For me, it is one of my heart spaces—a particular place that I return to when I can and which I hold in my heart while I am away. It means a lot to me that it is a space Cynthia and I share as I add my prayers to all the ones she prayed over the years she lived and studied there. As I sat there for four days, I realized that this space teaches me two important spiritual lessons that I want to reflect on this morning. The first lesson is this: a deep and authentic practice of prayer cannot be based on quick glances. In a world of rampant distraction and sensationalism, with the idolatry of busyness plaguing our lives—and it is idolatry—the call to share in, rest in, live in Christ’s heart demands that we look intently. We are called to stop and pay attention, to see with the eyes of our heart rather than the eyes of our egoic, shallow selves. We cannot be transformed if we only glance quickly. We must ponder—and pondering is, in a deep way, a giving of ourselves by dedicating our time, that precious commodity we have. No one was ever transformed through a quick glance, just ask Moses and the bush that caught fire. The second lesson is this: if we dare to ponder, to look deeply with the eyes of our hearts, we place ourselves in the position to be radically transformed by what we encounter, through God’s grace. This is no light thing! Once we notice and that place in our heart is awakened and that Christ-space is stirred within us, that space that vibrates when we encounter Truth, we simply are not the same. forgetting my cares among the lilies. We come to understand what it means to “grow into the full stature of Christ,” as our Baptismal liturgy reminds us. And, this is important because herein lies our challenge: we come to understand just what a life transformed by Christ’s indwelling presence is going to cost us. And cost us it will. There is nothing about a sincere practice of faith that is easy. Once we see, we cannot un-see—although we can resist the transformation that is offered when the eyes of our heart behold God’s presence. The challenge of this egoic resistance lies at the heart of our spiritual practice: will we continue to assert ourselves, or will we yield to God’s guidance? This, my friends, is why the scriptural accounts of regained sight are essential for us to ponder. Don’t just take a quick glance. Look deeply and intently—and open yourself to this heart transformation that is found here. The story of the healing of Blind Bartimaeus may, at first glance, seem simple. I would argue that it most certainly is not. Yes, it is a story about Jesus’ ability and willingness to heal, to give sight to the blind. But what else is here? I want to invite you to consider today that the very characters of this story—the blind man crying out for healing and restored sight and the crowd who “sternly ordered him to be quiet” are, in essence, those two parts of our own selves that, on one hand, recognize our blindness and cry out for a healed vision and, on the other hand, resist the challenge of the Gospel’s call on our lives. What if the story is actually about the wrestling within us, as we cry out for an expansive vision of God’s love while struggling with that part of our shallow self that wants only a quick glance, so that we can maintain what power and control we have? I believe that a deep part of us knows what dynamic effect the Gospel of Christ has on our lives. We have all had moments when our hearts hum at an encounter with the Truth of the Gospel. We know that following Christ—truly aligning our hearts with the Spirit’s compassionate flow—will cost us. It will cost us, in essence, our obsession with ourselves. We know that it will transform how we see society. We know how we will be called to move from our posture of grasping to a posture of gratitude and grace. And that can be a scary thing for people in a position of power. Sharing Christ’s heart will alter our vision, the way we see the world around us. Can we see the deep pain in a caravan of human beings. Human beings. People crying out for hope, for relief. It reminds me of a story I once read somewhere. And can we recognize the resistance we feel, with fear stoked up that they will somehow take something that is ours? My experience with the Spirit has shown me that the freedom I know through Christ wants to be shared, yet how often I fail…and hoard it as a possession rather than a gift of grace. Sharing Christ’s heart will break us open to understand the struggle of racism, of oppression. Am I willing to look intently, or do I only allow myself a quick glance? We also see the persistent struggle that families have with this toxic obsession with busyness and entitlement. In our participation with what Pope Francis calls the idolatry of money. The way we resist God’s call to care for the planet because someone in a position of power has convinced us that it will harm our immediate economy. How blind can we be? We all share many struggles, and the deep, transforming vision of Christ will change us, once we hear the Gospel’s call and the eyes of our hearts open, once we name the pressures of our lives and acknowledge our entrapment. We know that the invitation of Christ will cost us, and perhaps that is why we distract ourselves. What if our obsession with distraction and busyness is actually our ego’s way of silencing our heart’s deepest desire? Of course it is. I think of our political discourse. If we really wanted to solve these problems, these crucial struggles we all share, we would. But our egoic grasping for power sternly orders our heart’s desire to be quiet, and we occupy our time and fill our attention with silly slogans that seek only to manipulate or scare enough people to get them on “our side” so we can maintain our power and control. God forgive us. There is no way this is sustainable. And from my perspective as a parent of a middle-schooler, I am convicted by the habits and patterns we parents participate in. Why must our children be scheduled until seven or eight most night with activities? Why do we leave no time for pondering, for listening, for creativity, for rest? Why do we not teach our children the importance of a practice of faith, of dedication? Why do we wait until they face a crisis and then ask “where was God?” when the real question we should ask is “where were we?” Why do we think a quick glance will actually transform our hearts or the hearts of our children? We do our children no favors by cultivating this sense of entitlement. God forgive us. There is no way this is sustainable. I spent time this year at retreats with hundreds of people who have left or are leaving the Church entirely. I listened to their stories, and my heart broke, because I realized that so many people are wanting more. They want the Church to be more than a club. They are craving it to be the crucible of transformation that is called to be by Christ Himself. They are tired of quick glances. They want a deep vision. This is why the story of healed sight, of restored vision, is so important for us today. Because it is, in the end, a story about the deeper, inner struggle within each one of our hearts. Many sternly ordered him to be quiet, but he cried out even more loudly. St. John of the Cross, The Ascent of Mount Carmel trans. Henry L. Carrigan, Jr. (Brewster, Massachusetts: Paraclete Press, 2010). Stanza Eight of the poem itself. Book of Common Prayer, 304ff.